HARLINGEN — After nearly 12 years of no major hurricane hitting the United States coast, federal weather forecasters yesterday predicted a more active hurricane season this year. The National Oceanic and Atmospheric Administration predicts the season from June 1 through Nov. 1 will produce 11 to 17 named storms, five to nine hurricanes and two to four major hurricanes. “We’re expecting a weak or nonexistent El Nino this summer, and so based on what I know, in combination with the above-normal sea surface temperatures, they are expecting a 45-percent chance of an above-normal season,” said Mike Castillo, a senior forecaster with the National Weather Service in Brownsville. The last major hurricane to hit the United States — one with sustained winds over 111 mph — was Wilma in 2005. Hurricane predictions, storm tracking and intensity projections have improved dramatically in the past few decades, with early warnings from weather forecasters no doubt responsible for saving thousands of lives as people evacuate before hurricanes make landfall. Despite those technological advances, predicting the formation of a tropical storm or a hurricane, and predicting its intensity and track, are a formidable challenge to even the most modern weather scientists. El Nino has emerged as one of the more important indicators of hurricane activity over a summer. The phenomenon wasn’t discovered by scientists, but was first noticed by Peruvian fishermen in the Pacific Ocean. They found they weren’t catching as many fish when the waters off the coast warmed significantly. This pool of warm water was named El Nino since it occurred in late December, near Christmas. A reverse of El Nino, a pool of cool water in the same area, has since been dubbed La Nina. Both affect global weather. “Strong El Ninos, along with wind shear, typically suppress development of Atlantic hurricanes, so the prediction for weak conditions points to more hurricane activity this year,” NOAA’s Climate Prediction Center reported. El Nino today is relatively weak, or as meteorologists say, neutral. Last year leaned a little to La Nina, weather forecasters say. “El Nino is one factor, not the only factor, but it is an important factor,” Castillo said yesterday. “We also look at surface temperatures, wind shear, and sometimes we deal with Saharan dust that can also cause lower activity than normal,” he said yesterday. Dust from the vast Saharan Desert in north Africa blowing out over the Atlantic Ocean can inhibit thunderstorms from developing, and leave some of the most powerful potential hurricanes in the Atlantic basin stillborn. Catastrophic Category 5 storms Camille in 1969 and Andrew in 1992 both started as tropical waves off the African coast near the Cape Verde Islands. The long cross-Atlantic journey of storms forming in the region allow the systems ample time to absorb warm waters from the ocean and become stronger. 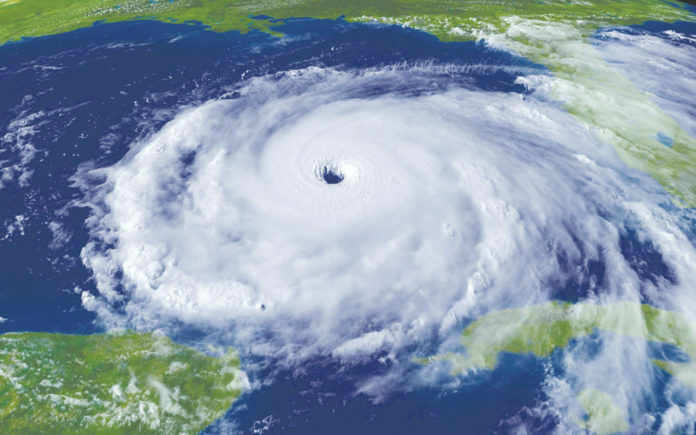 Since hurricanes have no force to drive them in any specific direction, they almost always wander from east to west with the rotation of the planet. Strong high pressure systems can, however, push them north or south or even back to the east, common with storms traveling northward up the U.S. Atlantic coast. In the Rio Grande Valley, much of the potentially dangerous tropical activity comes from storms born much closer — the Caribbean or the Gulf of Mexico. Hurricane Earl, which came closest to the Rio Grande Valley last year, was an example of one of these storms. Earl formed as a tropical wave off the coast of Jamaica and became a Category 1 hurricane on Aug. 3. “It did 250 million dollars worth of damage, and almost 100 fatalities, and if things had lined up just a little bit differently, that’s one storm that could have caused some issues for us here in the Valley,” Joshua Schroeder, science and operations officer for the National Weather Service in Brownsville, said yesterday at a hurricane workshop at KGBT-TV’s studios in Harlingen. “Fortunately, it did not,” Schroeder added. The storm deaths were primarily due to landslides and flooding. A strong weather pattern called the Bermuda High extended westward from the U.S. East Coast to the Central Plains, and this is what probably saved the Valley region, Schroeder said. The strong high pressure ridge never allowed Earl to swing north, and instead the storm crossed the Yucatan Peninsula and spun west into Mexico, far to the south of the Rio Grande Valley.